Yesterday, hundreds of members of CUPE 1975 joined together with friends and supporters at the University of Saskatchewan’s University Bowl to tell members of the Executive Board to keep their “Paws off our Pensions”. The rally comes after a recent arbitration ruling in the university’s favour, which the U of S has insisted gives them the right to make unilateral changes. Unless they are able to negotiate the terms of their pensions, this will be the first time that CUPE 1975 members will HAVE ABSOLUTELY NO SAY on the amounts and guidelines of their life-long retirement savings. The “Rally at the Bowl” event began at the University Bowl and included speeches by CUPE Saskatchewan President Tom Graham, and former CUPE National President Paul Moist. 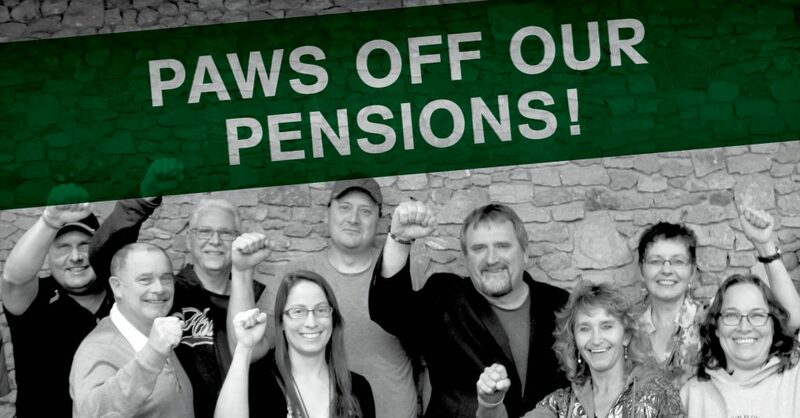 The event concluded with members of CUPE 1975 peacefully delivering hundreds of “Paws off our Pensions” postcards, which were signed by concerned members of the public, to a meeting of the U of S Board of Governors. Craig Hannah, president of CUPE 1975, expresses the deep concerns of his 2,000 plus members. “Our members are committed to making this University run smoothly and have spent years planning their retirement based on a commitment by their employer. Now suddenly they want to break their promise, and as a result people are understandably anxious about their futures”. CUPE 1975 and the University of Saskatchewan have a long history of bargaining in good faith over the pension plan. For years, changes to the pension plan were made at the bargaining table. But now, the University is threatening to make unilateral cuts to the pension plan outside of the collective bargaining table. If the University has their way, workers will lose their voice when it comes to their retirement.